120 professional photographers from 25 nations submitted a picture to the competition for the Mirabaud Yacht Racing Image 2014. Spanish photographer Alfred Farré won the main award while Charles Marion won the public prize. Based in Barcelona, Alfred Farré has been a professional nautical photographer since 1984. 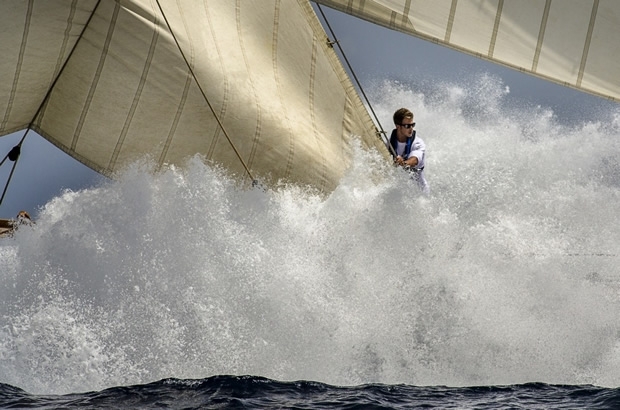 His picture (above) shows the classic yacht Mariquita pounding into a wave during the VII Puig Vela Classica Barcelona 2014. "I am very honored by this prize," said Farré during the prizegiving at the World Yacht Racing Forum. Alfred Farré won the Mirabaud Yacht Racing Image trophy as well as a Zenith El Primero Chronomaster 1969 watch. One of the judges, Ken Read, President of North Sails Group, paid tribute to all the photographers involved in the contest: "One of sailing's enduring qualities is the fact that a single photograph can tell more about our sport than a book of words. The top three photographs are obviously three out of dozens, which I thought were special. Power, grace, modern and old fashioned beauty, athleticism, variety. The beauty certainly is in the eye of the beholder. Thanks to all." Charles Marion won the Public Award, selected by the delegates from the World Yacht Racing Forum - an aerial view of a Wally yacht and its shadow. The delegates were asked to name the best yacht racing photograph of the year from the 20 pictures selected by the public on internet.